Roth Audio unveils £149 Sub Zero soundbar | What Hi-Fi? 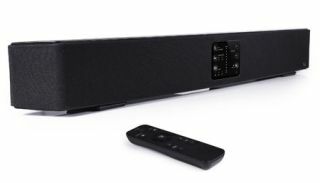 New from Roth Audio is the £149 Sub Zero soundbar, due on sale in the UK from July 9th. It joins the Bar 1 model already in the range. As part of its support for the British Association for Adoption & Fostering (BAAF), a share of the sale proceeds from the Roth Sub Zero will be donated to the charity, which campaigns for better outcomes for children in care. BAAF runs offices in England, Northern Ireland, Scotland and Wales, and members benefit from its role as campaigner, consultancy, family finder, publisher and training provider. Designed to "transform disappointing TV sound, but without breaking the bank", and for use with 32in to 42in screens, the Sub Zero is intended to be easy to set up. It includes an optical input for connecting set-top boxes such as Freeview receivers, Sky+ HD and Virgin TiVo, as well as RCA stereo analogue inputs, and a 3.5mm mini jack. There's no separate subwoofer, instead the Sub Zero uses a Class HD amp to power a pair of built-in bass drivers. There are eight drivers in total, including two vector firing side drivers for an enhanced stereo effect. A remote control allows sound adjustments from your listening position, the LED display is dimmable and the price includes table stands as well as wall brackets.